The Balfour Declaration in the Times of London, 9 November 1917. A striking aspect of Palestinian culture is its resistance to the realities of the past. On September 22, 2016, Palestinian Authority (PA) president Mahmoud Abbas addressed the UN. He said, "100 years have passed since the notorious Balfour Declaration, by which Britain gave, without any right, authority or consent from anyone, the land of Palestine to another people." He went on to demand an apology from Britain. Abbas has had previously threatened to sue London for damages resulting from the declaration and the creation of Israel. This storm against the past was also on display at a recent conference at University College London that brought together British Islamists and revisionist Israelis to demand that the British government apologize for the Balfour Declaration, with the ultimate aim of exposing "the illegality of the state of Israel while giving practical steps in campaigning towards an end to the Israeli occupation of Palestine." What do such efforts tell us about Palestinian culture and the prospects for peace? The Balfour Declaration is a singular datum for Israelis and Palestinians alike. After lengthy negotiations between the British government and the Zionist movement, Arthur Balfour, the British Foreign Secretary, issued his famous statement on November 2, 1917. 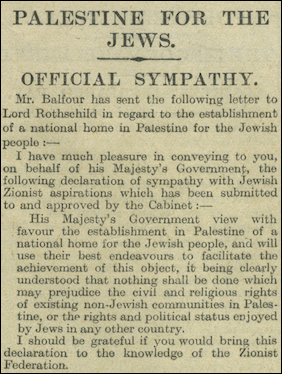 Balfour's letter to Zionist leader Lord Rothschild, in which he stated that the Cabinet viewed "with favour the establishment in Palestine of a national home for the Jewish people," was only one of a series of British wartime communications regarding the fate of the Levant. The correspondence between the British High Commissioner for Egypt, Sir Henry McMahon, and Hussein Ibn Ali, Sharif of Mecca, and the secret Anglo-French agreement between Sir Mark Sykes and Charles Georges-Picot were no less consequential in the shaping of the contemporary Middle East. 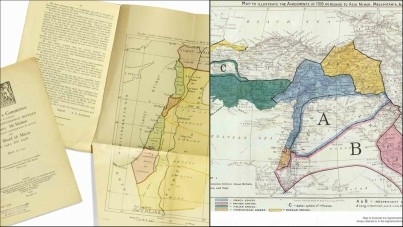 The 1915-1916 McMahon-Hussein correspondence (left), and the 1916 Sykes-Picot agreement were no less consequential than the Balfour Declaration in shaping the contemporary Middle East. It took the Arabs some time to voice their opposition to the Declaration. The British report on the 1921 Palestine riots noted that "The Mayor of Tulkarem talks about the Balfour Declaration, and, whether he has or has not a clearer notion of its import than other people, he certainly expresses his opinion about it very definitely." Palestinian objections to Balfour are neatly captured by historian Bayan al-Hut: "This is a promise that was made by someone who had no right to give it to those who had no right to receive it." The British establishment itself was divided and began to respond negatively to Zionism and Balfour in the early 1920s. This reflected the fusion of the establishment's traditional anti-Semitism with its growing realization that the League of Nations' mandate for the implementation of the Balfour Declaration was an impossible encumbrance on an empire bled white and financially exhausted by war. This attitude was a pronounced undercurrent throughout the Mandate years. According to Palestinian historian Walid Khalidi, one British official, Acting District Commissioner for the Galilee Blenkinsopp, used to circulate a "refutation" of the Balfour Declaration to his colleagues every year on November 2. Palestinians have cast the British Mandate as the illegitimate exercise of imperialism. In the past, Palestinians have cast the Mandate as the illegitimate exercise of British imperialism, where, as al-Hut put it, "One people grant[ed] a second people what belong[ed] to a third people." Nowadays, the opposition to the Balfour Declaration describes it as the beginning of "settler-colonialism." This innovation neatly saddles Britain's carefully cultivated sense of post-imperial guilt with responsibility for "Israeli crimes," including "complicity" in the supposed "cultural repression" of the Palestinians. At the same time, the approach promises to redeem the long-standing Palestinian sense of besmirched honor at having failed to "resist" Zionism. But the current effort against Balfour also illustrates other standard Palestinian responses. For one thing, it unironically emphasizes Palestinian powerlessness and Arab weakness in both the past and the present. "Resistance" against the British Empire and the Zionists, both non-violent and violent, failed – and therefore, consistent with historical Palestinian practice, the issue must be internationalized. The irony, however, is that Balfour's wholly legal commitment, ratified by the League of Nations in 1920, is assailed much the same way the 1947 UN Palestine partition recommendation was condemned: as illegitimate and unfair. For Palestinians, internationalization must produce the result they want, despite the historical record of its rarely doing so. A British apology would have little direct value in helping to establish a Palestinian state. There are other traditional elements in the campaign against the Balfour Declaration, not least the mistaking of symbolism for practical action. Presumably an apology would achieve a partial restoration of Palestinian national honor and comprise another step towards the complete eradication of Israel. However, despite vague talk from Palestinian activists demanding "compensation for Balfour" – which would be set against competing claims for compensation by Jewish refugees from Arab countries – it is difficult to see what direct value an apology would have in helping to establish a Palestinian state. Demands for apologies and compensation have changed little since the UN's Economic Survey Mission reported on a visit to Gaza in 1949: "In one of the camps, the refugees staged quite a demonstration. A large sign had been printed in English on which were the following, numbered as indicated: 1. Send us back home. 2. Compensate us. 3. Maintain us until we are refreshed. Just what they had in mind by 'refreshed' I leave to your imagination." The current Palestinian leadership's sense of timing, and commitment to symbolism, deserves comment. Whereas from the 1960s onward Yasser Arafat navigated the Palestinian movement through the shifting currents of Third Worldism and the Cold War, today that skill is nowhere evident. Protests over the Balfour Declaration anniversary are emerging just as the Arab state system finds itself at its lowest ebb. Syria, Yemen, and Libya are effectively no more, Iraq is divided between an Iranian rump, a shrinking ISIS entity, and an independent Kurdistan (in all but name), and Lebanon is a Shiite-dominated shell. The Palestinian Authority is a pseudo-state that exists only thanks to foreign aid and Israeli security assistance. The tone of the Balfour Declaration protests – "What is happening in Palestine is the biggest social injustice of our time," as a conference organizer put it – is therefore not simply a lament for an era when Palestinians were ostensibly at the center of Arab and Muslims politics, but resistance to empirical reality. The Balfour apology campaign is yet another Palestinian effort to deny and rewrite historical facts. The Balfour apology campaign is thus another element in the Palestinian wars against inconvenient historical facts that must be denied, attacked, rewritten, or otherwise assailed, rather than debated, conceded, or shared. This approach accounts for such extraordinary Palestinian claims as Arafat's denial that there was ever a Jewish Temple in Jerusalem; Saeb Erekat's statement that the Palestinians are descendants of Epipaleolithic inhabitants, and thus the "real" indigenous population of the land; and the more consequential insistence that Jews are only adherents to a religion and not members of a nation. Here "resistance" elides into stubborn fabulism. Reality must be made to conform on the basis of both religious ideology and fantastical invented elements. Palestinian examples must be set into broader contexts, from religious claims regarding perfidious and cursed Jews to plaintive historical claims regarding the Muslim discovery of America, the invention of flight, and, more darkly, Zionist attack sharks or the "conspiracy to destroy Islam." These concepts – redeeming fallen honor, perpetual victimhood, international responsibility, and achieving through guilt what politics and force of arms cannot – are cultural ideas, transmitted endlessly by Palestinian leaders and through their educational system and media. But they are also reflected in Palestinian politics. At every turn, negotiations get to a stage and then stop because compromise would preclude full "restoration" of what never was. Fighting century-old events and hoping to produce another outcome is consistent with this pattern. It is unlikely to build either a stable Palestinian society or peace with Israel. Alexander H. Joffe, a Shillman-Ginsburg fellow at the Middle East Forum, is a historian and archaeologist. He is co-author, with Yaya Fanousie, of Monumental Fight: Countering the Islamic State's Antiquities Trafficking.